This article is about the dish. For the 2005 film alternatively titled Hainan Chicken Rice, see Rice Rhapsody. Hainanese chicken rice is a dish adapted from early Chinese immigrants originally from Hainan province in southern China. It is considered one of the national dishes of Singapore. Hainanese chicken rice is most commonly associated with Singaporean, Malaysian and Hainanese cuisines, although it is also popular in Thailand and Vietnam. It is based on a well-known Hainanese dish called Wenchang chicken (文昌雞), due to its adoption by the Hainanese overseas Chinese population in the Nanyang area (present-day Southeast Asia). Catherine Ling of CNN describes Hainanese chicken rice as one of the "40 Singapore foods we can't live without". It also listed at number 45 on World's 50 most delicious foods complied by CNN Go in 2011. 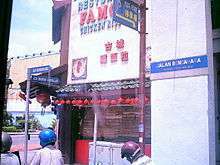 In Malaysia, as in Singapore, chicken rice is available in many Chinese coffee shops, restaurants and street hawker stalls, and also in chain restaurants such as The Chicken Rice Shop and OldTown White Coffee. The chicken is prepared in accordance with traditional Hainanese methods, which involve poaching the entire chicken at sub-boiling temperatures. The resulting stock is skimmed off and some of the fat and liquid, along with ginger, garlic (and in the case of Singaporean and Malaysian chicken rice, pandan leaves) is used in the cooking of the rice, producing an oily, flavourful rice sometimes known as "oily rice". The Hainanese prefer using older, plumper birds to maximise the amount of oil extracted, thus creating a more flavourful dish. Over time, however, the dish began adopting elements of Cantonese cooking styles, such as using younger birds to produce more tender meats. 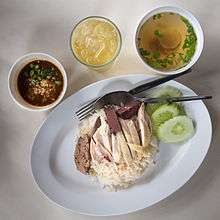 In Singapore and Malaysian chicken rice, the bird is dipped in ice after cooking to produce a jelly-like skin finishing, commonly referred to as báijī (白雞; "white chicken"), while Thai khao man gai notably omits this step. Chicken prepared by braising – lǔjī (滷雞; "stock chicken") – or roasting – shāojī (燒雞; "roasted chicken") – may also be used. In most countries, the dish is served with a dipping sauce of freshly minced red chilli and garlic, usually accompanied with dark soy sauce and freshly ground ginger. Fresh cucumber boiled in the chicken broth and light soy sauce with a dash of sesame oil are served with the chicken, which is usually served at room temperature. Many stalls, especially in Singapore or Malaysia, now offer deboned chicken. The prevalence of stalls selling Hainanese chicken rice as their primary specialty in Singapore underscores the dish's popularity amongst Singaporeans and overseas visitors. Hainanese chicken rice is considered one of the national dishes of Singapore, and is often served at international expositions and global events abroad, and in Singaporean-run restaurants overseas. Hainanese chicken rice is also one of the few local dishes served on Singapore Airlines flights. In Singapore, Hainanese chicken rice is served everywhere from school canteens, hawker stalls to major restaurants. There are Hainanese chicken rice stalls that have established franchise or branch outlets, and these include Five Star Hainanese Chicken Rice, Boon Tong Kee, Loy Kee, Wee Nam Kee and others which have many outlets island wide. It is very common to find Rice Balls in such chain eateries. The price range is around S$2.50–4.50 (the latter if the dish includes a drumstick). Most stalls serve extras such as braised dark soy hard boiled egg, chicken liver, braised dark soy firm tofu (Tau-kwa) and kai-lan with oyster sauce as side dishes and a bowl of plain chicken stock soup. The choice of white (steamed) or roasted chicken is commonly available at almost all eateries. Hainanese-owned coffee shops tend to serve a variety of Hainanese cuisine, with chicken rice being the main highlight. Other Hainanese dishes include pork chop, vegetables, fish, eggs and char siew. Most of these shops are air-conditioned, and are mainly concentrated at Purvis Street and Seah Street. The dish was popularised in Singapore in the 1950s by Moh Lee Twee, whose Swee Kee Chicken Rice Restaurant operated from 1947 to 1997. Most chicken rice vendors in the country also offer an alternative of roasted chicken instead of the regular poached or steamed chicken. Other variations include a BBQ version or also a honey-roasted choice. Some restaurants offer Guangxi style white cut chicken (Chinese: 广西白切鸡) as part of the chicken rice experience. An important heritage dish for Malaysian Chinese descended from immigrants from Guangxi province, it is always served during festive or special occasions. The chicken is drenched prior to serving with nam, a sauce prepared with chopped garlic chives, ginger, sesame oil and soy sauce. 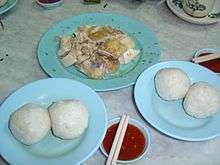 In Malacca, the chicken rice is served as rice balls rather than a bowl of rice, commonly known as Chicken rice balls. Steamed rice is shaped into golf ball-sized orbs and served alongside the chopped chicken. This dish is eaten the same way as the regular version, making sure to get a portion of chicken, some rice and the soy and chili condiment into each mouthful. Older chefs argue that the rice was originally shaped into balls because it needed to be kept warm from the time it was cooked (often earlier in the day) until mealtime. The rice balls, when stored in wooden containers, apparently stayed warm for a longer time. The other theory is that the rice balls were more portable and were easier for labourers working on plantations to transport from home. Today, rice balls are appreciated more as a novelty than anything else. Bean sprouts chicken (ngah choi kai) of Ipoh, Malaysia, is a related dish. The chicken is served with blanched bean sprouts and white rice instead of seasoned rice. This is a very popular version of the rice and many other chicken rice stall have slowly followed it by adding in bean sprouts along with the chicken. The chicken rice dish can also be further accompanied with a simple pork meatball soup. In addition to that, various hawkers also sell a variety of chicken innards – gizzard, liver, intestines – which are also equally popular for chicken rice lovers. Chicken rice, or nasi ayam, is also very popular with the Malay community, with the dish adapted to suit the Malay liking for spicier and more robustly flavoured food. The chicken is steamed, and then fried or roasted, although this usually result in a drier texture for the chicken meat. The chili condiment has also been modified: less garlic and ginger are used, and tamarind juice is added to the condiment for a tangier taste. Chicken rice has become extremely popular among the Muslims in Malaysia such that certain food stalls can survive very well by serving only Chicken rice. Hainanese chicken rice is a common dish in Thailand where it is called khao man kai (Thai: ข้าวมันไก่), literally meaning "oiled rice [with] chicken". The chickens used in Thailand for this dish can be free range chickens of local breeds, resulting in a leaner and tastier dish, but increasingly meat chickens from large scale poultry farms are being used. Khao man kai is served with a garnish of cucumbers and occasionally chicken blood tofu and fresh coriander, along with a bowl of nam sup, a clear chicken broth which often contains sliced daikon. The accompanying sauce is most often made with tauchu (also known as yellow soybean paste), thick soy sauce, chilli, ginger, garlic and vinegar. In many of the more traditional khao man kai shops, it will be available only from breakfast until lunchtime. Wikimedia Commons has media related to Hainanese chicken rice. ↑ Kugiya, Hugo (2010-03-18). "Singapore's national dish: Hainan chicken rice". Crosscut.com. Retrieved 2013-10-03. ↑ Ling, Catherine (April 14, 2010). "40 Singapore foods we can't live without". CNN. ↑ "How to Make Khao Man Gai ข้าวมันไก่: Thai Version of Hainanese Chicken and Rice". She Simmers: Thai Home Cooking. 9 June 2009. Retrieved 26 September 2014.